at 2211 Glendale Boulevard, Los Angeles. Ridge Silver Lake has a total of 10 units. 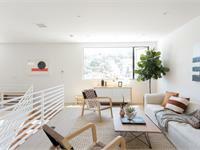 Ridge introduces 10 modern homes to LA’s vibrant Silver Lake neighborhood. In a strong departure from the formulaic small lot model, Ridge offers 2 to 3 bedroom homes ranging 1,630 to 3,060 square feet, with unique layouts designed to maximize views and privacy. Each home has been crafted with care and attention to detail that enhance livability and a sense of place. Every Ridge home reflects superior quality and workmanship in a light and sophisticated design. 7" plank engineered Oak flooring throughout. Steel and Douglas Fir wood floating staircases. Polished concrete flooring on first level. Dale white penny tiled bathrooms. Isenberg lighting fixtures and faucets. Your inquiry will be delivered to the Ridge Silver Lake sales team, who will send you more information about this development.